Satellink is a premium provider of microwave products and subsystems, offering state-of-the-art custom frequency converters for a range of applications across industries including aerospace, telecommunications, and the military among others. Available types include down and up converters, built to customer specifications and application criteria. Converters are lightweight at 1 oz - 10 oz, with typical sizes 2 in³ - 10 in³, and possible sizing up to 200 in³. 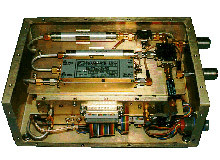 Product features are optimized for performance and maximum reduction of noise interference, they include single and dual conversion, local oscillator monitor output, lock indicator, automatic external reference oscillator frequency determination, synthesized phase locked local oscillator, and remote intermediate frequency bandwidth filter control. Converters are used after the amplifier in a system, and are sometimes combined with low noise amplifiers (LNA). Filters available for tailored passband transmission include preselection, image rejection, IF, and switchable bandpass. Other design options include customized interface and connections, sealed or pressurized units, and peak pulse protection. Satellink’s units cover a wide dynamic range of -100 to 40 dBm and handle L, S, C, X, SHF, KU, and K bands of the electromagnetic spectrum. All units are provided with controller equipment and EMI/RFI shielding. Frequency converters are comprehensively tested for functionality and accuracy, undergoing environmental tests, scalar and vector network analysis, noise measurement inspection, frequency counters, and spectrum analyzers. Typical turnaround times are 140 - 180 days with prototype to production volume (1 - 2000 units) available. All manufacturing takes place in Satellink’s ISO 9001:2008 certified facility, and meets all applicable industry standards. 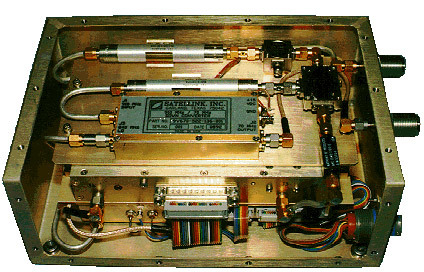 Satellink boasts unparalleled manufacturing expertise not found elsewhere in industry, along with offering a host of unique value added ancillary services. For more information about precision custom frequency converters please see the table below or contact Satellink directly. PrivacySite MapSite created by Thomas Web Solutions© 2013, Satellink, Inc.